United States Ambassador to Nigeria, Mr. Stuart Symington, on Sunday visited Adekunle Anglican Primary School, in Makoko, Lagos State. Symington visited the community as part of the activities marking the Public Diplomacy [JB emphasis] Grant to Slum2School Africa, during which instructional materials were provided for the school. The visitor and his team also provided health and psycho-social support for the pupils of the school. Slum2School is a non-profit initiative aimed at improving access to education for children who live in hard-to-reach slums across Nigeria. The sponsors seek to harness resources towards bridging the enrollment gap between orphans/vulnerable out-of-school children and children in school, through the provision of educational scholarships and other psycho-social support programmes. 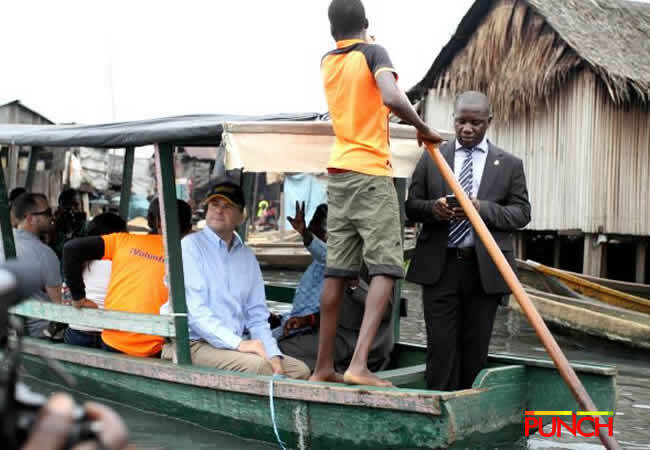 Symington went round Makoko community using a boat, during which he met parents of the pupils and leaders of the Makoko community.